Shop Electro Voice ND46 Dynamic Supercardioid Instrument Microphone from AMS with 0% Interest Payment Plans and Free Shipping. Precisely tuned to deliver a lively and balanced sound, the high-performance ND46 is designed for capturing a wide variety of instrument sounds. 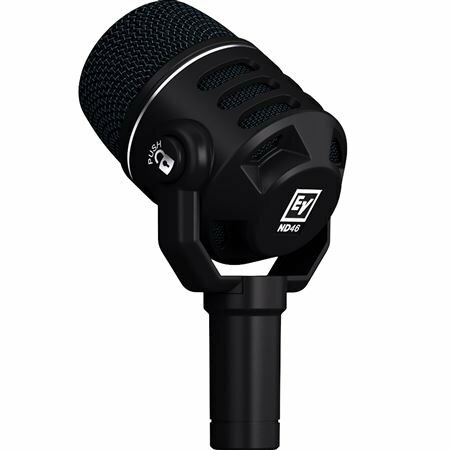 The dynamic Electro-Voice ND46 is a robust supercardioid instrument microphone features easy mic placement as well as excellent isolation from the sound of other nearby instruments. The ND46 dynamic capsule contains a large Mylar diaphragm which delivers a rich and detailed frequency response by combining its large surface area for tonal balance with its low-mass high-velocity material for exceptionally fast transient response. The ND46 locking pivoting head makes mic placement easy and precise. Achieve ideal mic placement by pushing its button, pivoting the head into position, then releasing the button to lock the head's position. The ND46 capsule uses a humbucking coil that attenuates AC hum and electromagnetic interference. ND dynamic mics can be used with confidence near speaker cabinets and EMF generating equipment racks. The ND46 Memraflex grille is made of a durable tightmesh grille wire that withstands extraordinarily-rough treatment. Your microphone remains protected and looking good gig-after-gig, year-after-year. For additional protection, the ND46 capsule contains a hydrophobic cloth membrane which prevents moisture and debris from reaching the diaphragm. Excelente step up for drums recording. I like this mic for the versatility. I can Mike and amp, my saxophone or a drum. Works great.